Key Difference: Routine Urine Test is an array of tests performed on urine and can be conducted to indicate the presence of a disease or condition. Culture Urine Test is a type of test conducted to diagnose a urinary track infection, as well as to isolated and identify the bacteria or fungus responsible. The urine is basically a way for the body to dispose of the body’s waste. Yes, urine is a waste disposal system. It is a liquid by-product of the body that is secreted by the kidneys and disposes the waste products of the cellular metabolism. Cellular metabolism generates numerous water-soluble chemical by-products that just result in floating around in the bloodstream, of these many are rich in nitrogen. These by-products need to be expelled from the body. Routine and Culture Urine Tests are two difference types of urine tests that are conducted on the urine. Routine Urine Test, also known as urinalysis or routine and microscopy (R&M), is basically conducted to indicate the various types and quantities of the water-soluble chemicals present in the urine. An excess or insufficiency of a certain type of chemical in the urine can indicate the health of the patient and are commonly used as a diagnostic tool. Urinalysis includes many different types of tests. Urine can be evaluated by its physical appearance such as color, cloudiness, odor, clarity, etc. or through macroscopic analysis, as well as based on its chemical and molecular properties or microscopic assessment. Macroscopic analysis checks things like red blood cells, white blood cells, casts, crystals, bacteria, yeast cells, parasites, or squamous cells. Urinalysis is a great and commonly used diagnostic tool as it can help indicate a variety of health issues and problems, such as liver failure, kidney failure, kidney stones, a variety of infections, diabetes, hypertension, abdominal pain, painful urination, flank pain, fever, kidney impairment, muscle breakdown, etc. It can even help prevent a variety or illnesses and diseases if caught in time. Culture Urine Test, on the other hand, is something similar but different. Culture Urine Test is a specific type of urine test that is used to diagnose a urinary tract infection (UTI). Generally, urine in the bladder does not contain any bacteria or other organisms such as fungi. However, on its way out, the urine can pick up bacteria from the urinary tract. Hence, identifying the type of bacteria or fungus present in the urine can help diagnose the type of infection and hence effectively treat it. The types of organisms causing the infection are identified with a microscope or by chemical tests. In a Culture Urine Test, a sample of urine is taken. Then various tests are run on it to figure out weather or not it contains the presence of bacteria or fungus. This includes growing the bacteria or fungus into cultures, which basically means fostering their growth in a controlled environment. These cultures are then used to identify the bacteria or fungus responsible for the infection, as well as to figure out which treatment will be most effective in treating the infection. The latter is figures out via a testing process called sensitivity. Is an array of tests performed on urine and can be conducted to indicate the presence of a disease or condition. Is often used as a medical diagnostic tool. Is a type of test conducted to diagnose a urinary track infection, as well as to isolated and identify the bacteria or fungus responsible. Is a medical diagnostic tool. Assessing particular symptoms such as abdominal pain, painful urination, flank pain, fever, blood in the urine, or other urinary symptoms. Diagnosing medical conditions such as urinary tract infection, kidney infection, kidney stones, uncontrolled diabetes (high blood sugars), kidney impairment, muscle breakdown (rhabdomyolysis), protein in urine, kidney inflammation (glomerulonephritis), etc. To indicate a urinary tract infection such as cystitis, pyelonephritis, or prostatitis. Also help identify Asymptomatic bacteriuria, which cause a urinary tract infection but without the usual accompanying symptoms such as frequent urination, painful urination or fever. 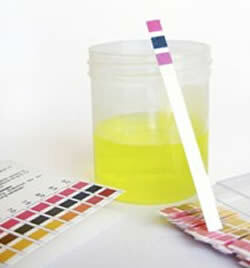 Color: Many things affect urine color, including fluid balance, diet, medicines, and diseases. Odor. Urine does not smell very strong, but it has a slightly "nutty" odor. Some diseases cause a change in the odor of urine. Specific gravity. This checks the amount of substances in the urine. It also shows how well the kidneys balance the amount of water in urine. pH. The pH is a measure of how acidic or alkaline (basic) the urine is. Sometimes the pH of urine is affected by certain treatments. Glucose. Glucose is the type of sugar found in blood. Normally there is very little or no glucose in urine. Presence of glucose in urine can indicate diabetes. Nitrites. Bacteria that cause a urinary tract infection (UTI) make an enzyme that changes urinary nitrates to nitrites. Microscopic analysis, which looks at things such as Red or white blood cells, Casts, Crystals, Bacteria, yeast cells, or parasites, Squamous cells, etc. Checking the urine for bacteria and fungus. 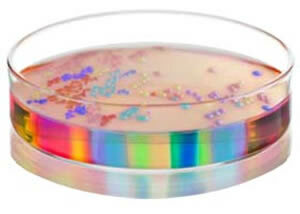 If presence is detected, then the bacteria and fungus are isolated and helped to grow into cultures. After which the cultures will be used to diagnose the specific type of bacteria and fungus via a variety of tests.